Today, October 10th, is not a good day for organized religion for on October 10th, 1793, Joseph Fouché decreed that the only acceptable worship would be that of "universal morality." Fouché even ordered the Supreme Being out of graveyards, with the Christian promise of resurrection replaced at their entrances with the atheistic message "Death Is an Eternal Sleep." The people of France's second largest city had been slow to accept the new order of things and actually had the audacity to rebel. Fouché arrived to guide them back to reason. 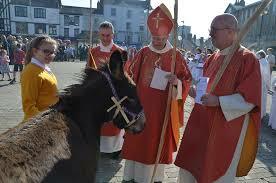 He started by parading the local bishop on a donkey that was dressed in the cleric's vestments and miter, wwiht a chalice around its neck and a missal tied to its tail. Oddly enough, on this same day in Brazil, the annual Festival of Light begins; the centuries-old festival which is celebrated for two consecutive weeks and includes a parade of penance and the lighting of candles, torches, and hearth-fires to symbolically drive away the spirits of darkness who bring evil and misfortune.